Get a free digital download of Scott’s latest book on intestinal parasites. What is your #1 health priority? “Your Personal Health Revolution Begins Here!”— with services provided by Scott W. Webb in Nashville, Tennessee. Do you struggle chronically with frustration, confusion, worry, and from hitting dead ends? It may benefit to learn more about how the digestive tract plays a role integrating entire bodily functions, including emotions. I have experienced my own personal health renewal through colon cleansing as a strategic leverage. For the past 18 years, I have provided safe and beneficial colonic therapy sessions to many in Nashville, Tennessee. This has led to a greater sense of wellness and happiness in the clients I see. When it comes to bowel cleansing, many have limited experience. In most cases, the topic is poorly understood or ignored. However, internal cleansing is worthwhile to investigate due to the many upsides. This website has been designed to provide a detailed overview of what you can expect. I’d have preferred to list this as ten bullet points, and in some ways, I have, with the seven priorities shown above. Read what you will, and learn what you can, because I’m just a resource for shortcuts that take us down the most optimal path forward. Like you, I was raised to believe that health was an implied guarantee of what we get simply by living in America. This actually used to be true, but not so much any more. For me, I accidentally stumbled into the concept of internal cleansing. I actually believed a colonic or an enema was something “unnatural,” but then discovered some additional, critical aspects. New clients will ask me my credential. I say, “I am healthy.” For the past 18 years, I’ve not required a doctor’s visit because I just have not needed medical attention. Is this the kind of success we seek? And can it be taught to others? You would probably have to tell me, because I’m putting it out there, totally FREE on this website, for your benefit and for your perusal. Call it stupid, if you will. Call it outlandish! Whatever it is, it’s worked for me. And it seems to work for my clients. Some of my clients have been coming to see me regularly for years. One started at age 50 and is now age 64. She is a former nurse and is married to a doctor. She just completed a total medical check-up and her doctor was amazed. The funny part is that she is healthy; her husband is not, while telling her that all she is doing to support her health is crazy. And that’s all it is. We are either achieving the results we seek or we are not. Click here, click there above, to see what it’s about. Yeah, it is a little crazy. It’s a crazy world, isn’t it? But why not live amidst it all and thrive? Feel free to contact me Monday through Friday during business hours for local area queries. Twenty minute phone consultations are free, but often must be scheduled. Call me today to discuss your internal cleansing questions and goals. General questions which are not local will require a consultation fee. Your time is valuable and so is mine. Medical laws will be strictly adhered to, which means no diagnosis, no treating, no prescriptive for any condition deemed as a medical illness. Thanks for your interest and always I wish you the best. The statistics tracking illnesses in America reveal that something isn’t working. Do we really need more books about HEALTH? Or another newfangled diet peppered with supplements and the occasional round of antibiotics? Probably not, suggests Scott W. Webb. Perhaps we might peer under the veneer of what’s going on and change the entire conversation regarding specific variables connected to what’s actually at play. The system right now doesn’t have handles and people are in need of handles, so they themselves can understand and manage their own change and empowerment. So, each chapter is designed to be like a new pair of glasses — put them on and now you can see. If the average American already understood it without reading this book, then the statistics tracking illnesses in America would reflect it. The conversation is about how to rise above a somewhat hilarious social conditioning and to step into what’s slightly more amazing. In fact, for the traditional health therapist or dietary consultant, this stuff is guaranteed to blow your mind. All kinds of dietary options have been presented, but few trace the path of food sourcing, farming methods, and recent preservation and safety concerns. Starting with the common potato, this book analyzes what might have gone wrong in recent years. This extends to a whole variety of foods including tomatoes, blueberries, onions, corn, and salad greens. Plus, most meats sold in grocery stores and served in restaurants — gone wrong. The bottom line is that the whole food system in America borders on many bizarre levels of conspiracy theory. This must be taken apart before dietary advantages can be understood and appreciated. Some things are so odd, who would believe it? How does the U.S. FDA office work? What are labs analyzing when it comes to food safety? How is the general public protected? Because the statistics of illness seem to suggest that Americans are mysteriously growing more ill and dying younger than ever before in history. It’s helpful to understand how food digests and how man-made chemicals are interpreted within the human body, triggering potential Domino effects as internal organs lose function. Micro-processes matter. What’s actually behind widespread depression, childhood illnesses, low iron, low thyroid, high cholesterol, diabetes, obesity, cancers and tumor growths, sleeplessness, inflammation, allergies, constipation, and more? We need to know. This detailed analysis traces popular attitudes toward wellness and medicine back to the Roman Empire with candor, wit, and unusual insight. Americans spend triple on health care costs versus Japan with a four-and-a-half year lower life expectancy than Japan and many European nations. Why? And what’s a probiotic? 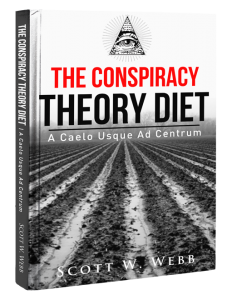 Follow the path of conspiracy theory applied to food and medicine in ways that will make you laugh at the sheer absurdity. Laughter is good medicine because conspiracy theory says the system is designed to generate illness and the question is: Are you and loved ones next? What is this type of parasite?